Red Maple Park - Excellent location, close to all amenities. 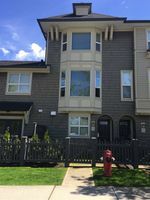 Lovely 3 level townhome, 2 large bedrooms, 2 bathrooms, open concept kitchen with granite, stainless steel appliances, spacious dining and living room with cozy fireplace. 9' ceilings, laminate flooring in the main living area. sunny deck off the kitchen. double tandem garage and full slip driveway, direct access to street and additional parking right out your front door. Complex has fantastic clubhouse featuring outdoor pool & hot tub, pool table, gym, guest suite, theatre room and playground. Excellent Value!